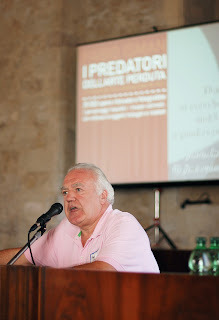 Peter Watson, author of numerous books including “The Medici Conspiracy” and “Sotheby’s the Inside Story”, leaned back in his chair in front of the audience and like an practiced storyteller, said that he would talk about “some unpublished and unpublishable” details about recent art crimes. He asked the audience to question about how much they knew about the truth of art theft. “Museums lie about provenance and experts are not experts,” he said. Watson spoke about the stories in his books, of how the priest with the Vatican’s mission trafficked in stolen paintings, pleaded for mercy on the court, and after the judge suspended his sentence, went on to trafficking in drugs. John Drew, the forger, was once suspected of burning down a house that killed a Hungarian lodger and two months ago was sentenced for defrauding a widow. When Robin Symes partner Kristos died, Symes went to jail. The judge changed the case from a civil to a criminal case. Symes was sentenced to two years in jail and only served 10 months. He made enemies with Kristo’s family. A month after Robin came out of jail, a BMW was deliberately set on fire and a yacht went up in flames. “Nothing was ever proved, but this is underlining the idea that we are not dealing with nice people,” Watson said. In regards to the Sevso silver, a strange murder in the late 1970s in a wine cellar showed three sets of footprints going into the wine cellar, and two going away. People accused of these crimes are “too dangerous”, Watson said. His friend Charley Hill, who recovered one of the Munch paintings while working for Scotland Yard, said that his children were threatened in a case. “This is a very unpleasant world so watch where you’re going,” Watson told the audience. ARCAblog: Author and Historian Peter Watson Discussed What He Called “Some Unpublished and Un-pulishable Details about Recent Art Crimes”. The Acropolis Museum by night is even more awe inspiring than during the day. 🎨 Tottenham Hotspur has become the first Club to create an art gallery within its stadium to showcase works of local artists.